You may be feeling as though you are stuck in the same place or wishing you could find a different path forward. 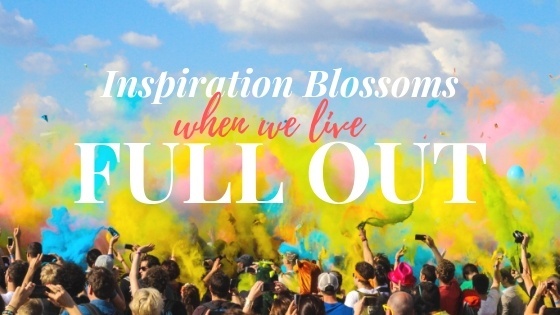 Living Full Out is a way of life, which encourages you to view the world from a new lens, empowering you to explore everyday with a renewed outlook. Through a variety of platforms, you can become prepared to take on everything life offers. Perhaps you are constantly busy with work or family obligations, and you find it difficult to discover time to inspire yourself. If that is the case, the Living Full Out radio show provides listeners with the convenient opportunity to discover motivation on the go. You will learn from an inspirational guest, who has overcome challenging circumstances. You can even call in to receive on the spot advice about a situation that has become an obstacle in your own life from certified life coach Nancy Solari. The days of struggling to find time for yourself in a busy world are over. Maybe your personal struggles are sensitive, and you feel uncomfortable sharing them in a public setting. If that is the case, private coaching provides an environment where you can feel at ease sharing your circumstances. Individualized coaching can guide you towards new behaviors that will transform your life, creating a more confident and resilient you. Discovering your full potential may have seemed difficult in the past, but now you can feel equipped to take on any challenge. It may be that you are searching for a way to motivate your employees and increase productivity in the workplace. Stimulating associates can become a reality with a corporate speaking engagement, which will allow them to return to work with a revitalized perspective. A focus on teambuilding and leadership will allow coworkers to tackle company goals with a refreshed vision and discover how a new mindset can bring success. Another option is the Living Full Out Blog, which brings relevant articles straight to your fingertips. It becomes easy to read about timeless topics that are often obstacles in our lives, such as dealing with stress, facing your fears, or making new friends. However, there are also several articles that address modern challenges, such as navigating dating apps and social media advice. Trending issues become easy to conquer as you explore what this blog has to offer. Regardless of the challenges you are facing, there is inspiration to be found. Finding time to focus on yourself in a hectic modern world can be difficult. However, the various options Living Full Out provides makes it more simple to find time to become inspired. Whether you are struggling to find time for yourself, or you are looking to motivate your employees in the workplace, there is an option available for you. Challenges are a common aspect of life, and without them we would struggle to progress. However, they do not have to be defining, and regardless of the circumstances there is always a way to Live Full Out.